This Monster Box of 150 Perth Mint - Kangaroo 1 oz. Silver Bars is a fantastic choice for collectors who are enamored with the iconic Perth Mint. The coins come encased in ten protective acrylic tubes, which themselves com in a white card storage box. The "P" Mint mark of the Perth Mint, arguably the most highly sought after Mint mark in the world, is included within the final "9" on the bars' reverse. Each bar in this monster box was struck from .9999 fine silver and measures 47.6 x 27.6 mm and 3 mm in thickness. The obverse of each bar matches that of the gold bar. It features stylized motifs of the animal most commonly associated with the country of Australia, the kangaroo. 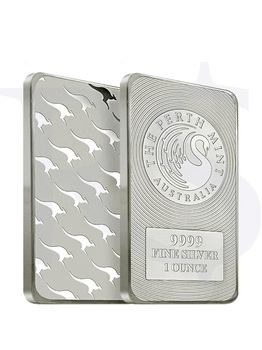 The reverse features the Perth Mint's LBMA registered mark amid radiating circles. Along the rim of the mark are two inscriptions, "THE PERTH MINT" and "AUSTRALIA." Below the mark is a rectangle that provides essential information about the bar, reading, "9999 FINE SILVER 1 OUNCE." Struck from .9999 fine silver, weight of 1 oz. The latest release from the Perth Mint. Single bars come in an individual Saflip Holder, 15 bars come in tubes, and 150 bars come in 10 tubes boxed in durable card packaging. 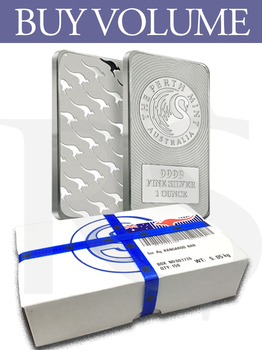 Weight and purity guaranteed by Perth Mint. Latest security feature – small “P” mint mark engraved on the last ‘9’ of the engraved 9999. Obverse: Features the 3D relief of the Perth Mint logo on a table of radiating circles with engraved weight, content, and purity. Reverse: Small diagonally arranged repetitive motifs of Kangaroo.